Part of the week’s actions included placing this mock Israeli apartheid wall on Manchester Plaza where it sat for the duration of the week. It features art, quotes, and information pertaining to the occupation and Palestinian liberation. Last month we were proud to launch the first ever Palestine Rights Awareness Week at Wake Forest University. As students who believe in freedom, justice, and equality for all, we were excited to offer our campus a chance to examine how Palestinians strive for the human rights that Israel has denied them for over 70 years. And a Thursday debrief and celebration of our week of events. Who are we and why did we organize this week of solidarity? We are a collective of students that together make up the Palestine Solidarity Coalition. We believe in values of freedom, justice, and equality, and we are concerned with human rights both in our community and abroad. We view Israel’s 70 year occupation of Palestinian land and dispossession of Palestinian people as one of the most important and ongoing human rights issues of our era. We understand that Israel is frequently shielded from criticism as “the only democracy in the Middle East” and “America’s biggest ally in the Middle East.” The purpose of this week is to center Palestinian voices and push back against the conflation of anti-Zionism and antisemitism, a distinction the student government recently ignored in a resolution. We wanted to demonstrate that the State of Israel does not actually embody principles of freedom, justice, and equality, and that its victims — primarily the Palestinians — have been subject to decades of oppression through the financial, military, and diplomatic support of the US. Why are Israel’s actions contradictory to human rights? Our history exhibit, “Palestine: A Brief History” sought to educate our campus about this reality. Since 1948 Palestinians have been subject to ethnic cleansing, colonialism, and apartheid. Over 75 percent of indigenous Palestinians were expelled from their land during Israel’s creation in 1948, and Israel has denied them their universal right to return to their homes ever since. After 1948, Israel demolished and replaced hundreds of Palestinian villages, and since 1967 has expanded its territory through a military occupation of the West Bank, Gaza Strip, and Golan Heights in Syria. Since 1967, Israel has moved hundreds of thousands of its citizens onto this occupied territory, in violation of the Fourth Geneva Convention. Through all of this time, it has allowed any Jewish person in the world to become a citizen, while denying that right to millions of Palestinians whose families resided on the land for centuries. Israel offers different levels of rights to Palestinians and Israelis even though it maintains military control and political influence over the whole territory between the Jordan River and Mediterranean Sea. This includes freedom of movement, access to fair trials, and access to water. None of this is democratic, just, or representative of the values we believe in. What is the difference between anti-Zionism and antisemitism? The disagreement we have with Israel and its supporters is over a political regime that favors one population and disenfranchises another. We believe that Zionism is a political movement founded on the oppression of another people. The right to self determination of a people does not include the right to expel, oppress, and discriminate against another population. Antisemitism is rooted in the hatred of Jewish people and has expressed itself in an attempt at genocide. We believe that everyone is worthy of rights and life. None of us is seeking to take these rights away from Israelis or Jewish people; the point of our work is that the State of Israel systematically denies Palestinians these rights. Why have the actions of campus Zionists and the University been unacceptable? · Poster removal was university-sanctioned vandalism: Our registered history display was the result of hours of work, careful research, and dedicated discussions between students, scholars, and activists. It was taken down after only six hours at the hands of a single student. We were not informed of the exhibit’s removal and had to track our materials down ourselves. Rather than receiving any type of apology or explanation from the university, a campus official told us that the distressed student “would like to speak with someone in your organization about the content.” We learned that the university told the student not to remove the displays, but did nothing to prevent him from doing so or hold him accountable for violating campus policy. Our exhibit was a registered event that was approved by all the proper channels on campus. While our exhibit was allowed to go back up, there still has been no formal apology from the student or the university. · The administration employed double standards (poster exhibit): Following the removal of our history exhibit, the Office of the Dean of Students opened up space that students usually cannot reserve so that Students Supporting Israel (SSI) could showcase “alternative information, beliefs, and perspectives” on a separate set of posters. This shows that a double standard was applied to us, since the university has not made space for “alternative points of view” on any other topic, including pro-Israel displays. 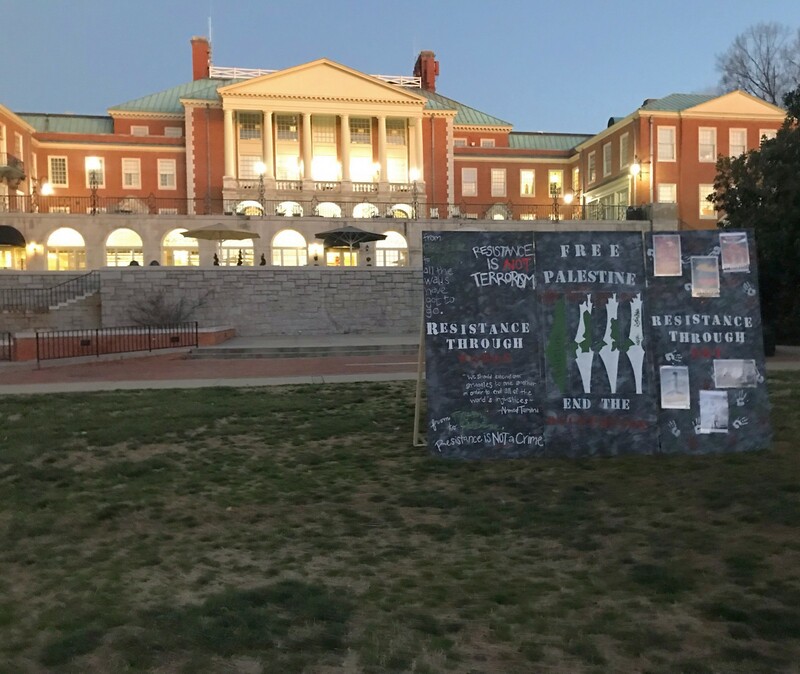 · Faculty interference in panel was intimidating and unprofessional: Students Supporting Israel and a Wake Forest communications professor subjected us to numerous emails harassing us about our Wednesday panel. This professor asked to be included on the panel we organized and when we politely declined, began to harass us with incessant questions about the speakers we selected, eventually ccing university administrators on his messages. As students, we have every right to plan an event with panelists of our choosing and do not owe a responsibility to faculty or other students to identify panelists in advance of the event. While the actions of Students Supporting Israel were bothersome, we found the aggression of the campus communications professor to be threatening and uncomfortable. · Our panelists were harassed: Due to the level of harassment we received, our student panelist no longer felt safe being on the panel. In addition, given our fear of disruption, we were forced to hire undercover cops and create a “marshal” program aimed at de-escalating situations with protestors. During the panel, pro-Zionist students held up signs aimed at intimidating one of our Jewish panelists. One person intimated that he was not being a real Jew. At the end of the panel, some protesters began videotaping and harassing our panelists. Some panelists had to be escorted to their cars by police, and a protester physically intimidated one of our panelists. Students Supporting Israel were outside the venue and intimidated some attendees. We have filed bias reports due to the harassment we faced from these students. We ask the university to respond in a manner that conforms to the university code of conduct. · Marginalized students have been targeted: In the course of planning this week of solidarity, Jewish students who oppose Israel’s human rights violations have had the authenticity of their religion questioned, and we have been falsely accused of antisemitism and affiliation with an Islamic movement in Egypt. These accusations are particularly threatening to the safety of Black, brown, and Muslim students and demonstrate that Jewish people who support Palestinian rights are marginalized by Zionist members of their community. Many of these attacks and allegations have happened on social media, creating false outrage and leading national Zionist organizations to call for action on our campus. · We had to cancel our debrief due to harassment: Due to the harassment of our panelists the night before and of marginalized students throughout the week, we felt that we needed to cancel our debrief event to ensure students and staff were not exposed to any more violence. · The administration has failed us: Wake Forest has repeatedly touted its commitment to free speech and the protection of its marginalized students, but given the events that transpired this week, we see that these commitments are not being fulfilled. Wake Forest needs to protect students and faculty from harassment — especially from other members of the campus community. So far the President, the Provost, Vice President of Campus Life, Vice President for Diversity and Inclusion, Dean of Students, and the President’s Chief of Staff have not responded substantively to a request from our lawyer to support and defend us from harassment. We call on the university to fulfill its promise to protect our rights to free speech, and we call on the campus community to join all who care about human rights to support a Free Palestine. All of these actions demonstrate the importance of having a Palestine Rights Awareness Week on our campus. Any time people attempt to raise the issue of Palestinian human rights, we are met with attempts to silence, delegitimize, intimidate or alter our speech. Whenever we talk about Palestine, people make the conversation about Israel. This is similar to when the Black community says “Black Lives Matter” and people reply “No, All Lives Matter.” Palestinian voices and issues deserve to be discussed in their own right. This is why we continue to fight for Palestinian human rights and independence in all forms. 1) Revise the Student Government resolution S.R. 6: The current definition proposed in the resolution follows the U.S. Department of State’s “contemporary examples of anti-Semitism.” This definition is vague, allowing easy cross-application to criminalize the liberation work of Palestinians at Wake Forest University. Specifically, “Blaming Israel for all inter-religious or political tensions” can be used to paint pro-Palestinian campaigns, as anti-Semitic. Additionally, clause three reads, “Student Government recognizes that some, but not all, criticisms of… Israel can be anti-Semitic dog-whistles and condemns such criticisms.” This clause is incredibly vague, allowing anyone to shift the lines of arbitration to determine which critiques are and are not anti-Semitic. As such, we call upon Student Government to remove the aforementioned clauses and to no longer recognize or abide by the State Department definition of anti-Semitism. 2) Pass a resolution condemning anti-Palestinian sentiment and actions at Wake Forest University. 3) Pass a resolution condemning Islamophobic ideology and actions at Wake Forest University. 4) Create a zero-tolerance resolution for white supremacy. 2) Wake Forest University to annually commemorate the Nakba on May 15th. The Nakba refers to the 1948 exodus of nearly half of Palestine’s Arab population from the region as a result of Israeli aggression. Over 700,000 people lost their homes on that day, and yet Wake Forest remains silent. This commemoration should take place through public social media posts on all relevant social media outlets (Instagram, Twitter, Facebook, etc) as well as a school-wide e-mail. 3) All relevant academic departments offer more programming geared toward educating about Palestinian liberation. This demand includes but is not limited to: Middle East and South Asian Studies, Politics and International Affairs, Jewish Studies, Study of Religions. These departments should make public efforts to commemorate Palestinian history, provide educational coursework to combat Zionist bias, and to offer safer space for Palestinian students. 4) The creation of a zero-tolerance policy for white supremacy. 5) A formal apology from the Dean of Students for his failure to protect the Palestine Rights Solidarity Coalition organizers’ right to free speech against aggression, both on and off campus. 6) A statement affirming the value of having student-run educational experiences like Palestine Week and promising to take steps to ensure that students feel supported in hosting Palestine Week and other similar events again in the future.